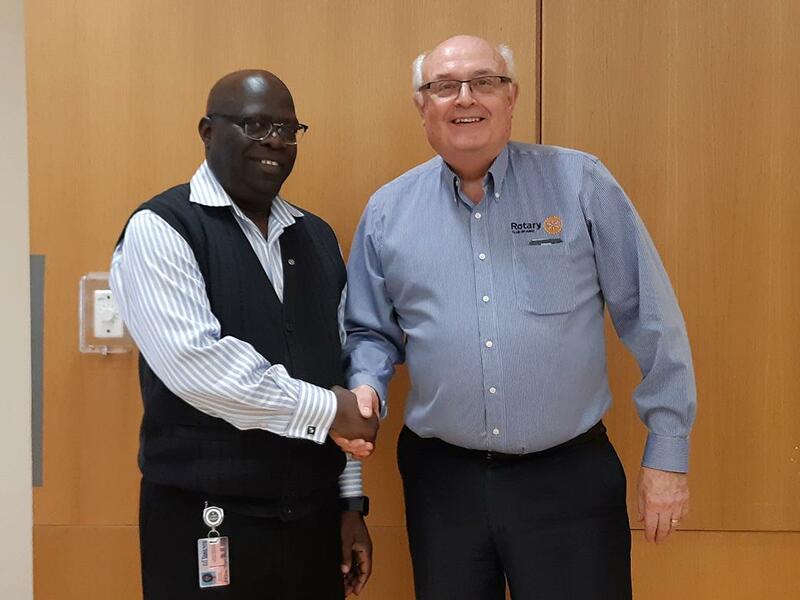 Past President Rene Soetens introduced our newest member Rotarian George Okurapa. Below are some highlights from George's classification speech. Welcome to the Rotary Club of Ajax! George is from Uganda where he attended school, including university. George graduated with degrees in sociology and political science in 1987. After graduation he fled to Kenya and lived and worked there for two years. He came across advertising regarding the federal immigration program in Canada and thought that Canada would be a good choice for his family. He was obviously successful with his application. However he had second thoughts given the temperatures in Canada. Nonetheless after his son was born he and his wife decided to emigrate to Canada and arrived in a very cold March of 1989. George comes from a large family. His father had seven wives and he has thirty-two siblings. (George only has one wife!) George has four children. Two are working, after graduating from university. Two children are still studying at York University. George applied for a job as a Manager at the Factory Carpet operation. He got lost en route to his job interview and arrived two hours late. Regardless, the interview panel decided to interview him. George offered to work for 50% of his salary in order to prove himself with the proviso that the company owed him the other 50% if he was successful. He stayed there for two years and then went to the City of Toronto in March 1991. He is currently the Community and Labour Market Manager for the City. He works with the City’s employers to determine their labour market needs and helps to match employers with employees to suit their business purposes. George is also a lecturer at Seneca College. He lectures on Canadian social policy. He is on the Board of an Ugandan Relief organization.